Part Health Club. Part Night Club. Find Balance With a Repair Class. PulsePDX, Portland's premiere dance fitness experience was founded in 2011 to provide Zumba® Fitness in a unique dance club setting. 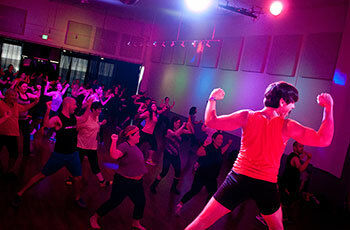 Since then we've expanded our class offerings to include exciting new formats like U-Jam Fitness®, Hip Hop Fitness. Pound Rockout Workout®, Zumba® Toning + Core and Glutes, and the Melt Method®. We have rounded out the studio's class schedule with innovative and unique classes like Burn and POP Pilates® which provide strength and repair elements to encourage a more complete health routine for our students. In addition, we frequently host master classes, workshops, and special events. Still not sure? Just stop by our location, centrally located just off I-84 on Sandy in the Hollywood district, and see for yourself why Pulse is going to be your very next favorite place to get fit and have fun.